David Karaus put on his skis last week at the Mount Washington Resort in Bretton Woods, N.H.
For a frugal tribe of bargain-hunting seniors, scarfing up the potpourri of newly available discounts can take some of the sting out of a milestone birthday. Turning 50 means activating an AARP member card to save 15 percent at Denny’s. The big six- oh shaves 30 percent off tickets at AMC movie theaters. And octogenarians ski for free at Bretton Woods, a New Hampshire resort dubbed “Medicare Mountain” by its grizzled regulars. “I’ve earned it,” said Justin O’Connor, a 66-year-old Woburn resident who estimates he saved $75 last year on daily pilgrimages to the local Dunkin’, where he gets 10 percent off his extra large decaf coffee. But some question whether senior discounts are warranted in an era when many of those enjoying them are relatively well off, while large numbers of younger folks strain under the weight of student debt and labor in a gig economy bereft of benefits. David Wallis, who leads the Economic Hardship Reporting Project, a nonprofit that supports journalism focused on inequality, argues that the deals for seniors are a relic of an earlier time. He calls for replacing them with income-based discounts for people of all ages. Extending deals to discount-deprived younger people could also help businesses reach out to a valuable market, he said. And if discounts were extended more broadly, it might lessen the stigma for baby boomers who are reluctant to accept them because they don’t want to think of themselves as old. Ben Brown, founder of the Association of Young Americans, which advocates for people between 18 and 35, said his group offers discounts to members on everything from sports events and concerts to Lyft rides and Megabus tickets. Indeed, many can’t afford to buy homes or save money. Data from Young Invincibles, a research and policy group, show that young adults today earn $10,000 a year less than their counterparts did in 1989. 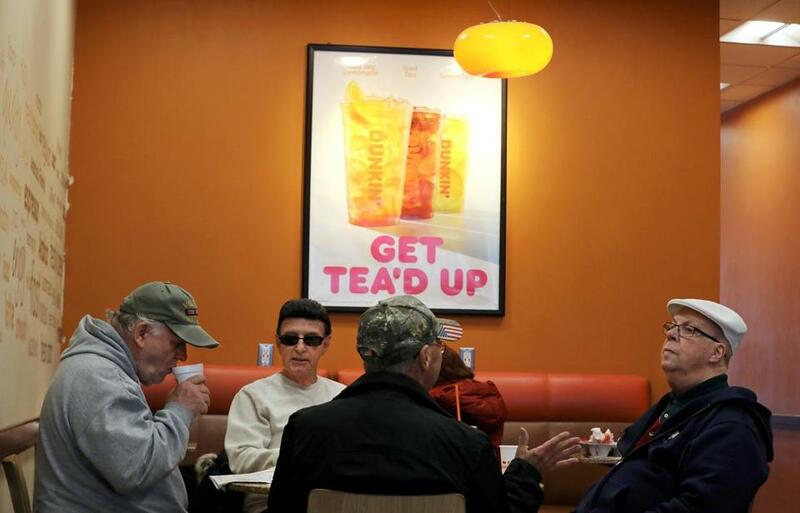 Joe Donovan (left), Michael D. Ambrosio (second from left), and Francis Wiemert (right) joined a friend at a Dunkin’ shop in Charlestown to drink beverages at a discounted rate. Seniors enjoy discounts on movie tickets, clothes, national park passes, and other goods. Senior discounts emerged in the 1960s as a way to help retired folks with meager savings. But many today work into their 60s and beyond. And with surging home values and financial markets, plenty of retirees have amassed formidable nest eggs they can draw on well into their 70s or 80s. Merchants offering senior discounts initially assumed people would only take advantage of them for a short time, but increased life expectancy has changed that calculus and stretched eligibility spans. But senior discounts have their staunch defenders. And they’re not all seniors. “They’re really a sign of gratitude to people who have been buying from these businesses all their lives,” said Boston University sociology professor Debby Carr, who studies aging and inequality in later life. “And just because some older adults are doing fine, we should remember there are still deep pockets of poverty” among those claiming senior discounts. Even some younger activists don’t begrudge seniors their savings. But he said it would be nice if businesses or public agencies extended some breaks to financially strapped younger people, too. A small band of pioneers has begun experimenting with income-based discounts. Lime and Bird, a pair of startups whose electric scooters recently debuted in Brookline, offer discounts on rentals to customers enrolled in Medicaid or the federal food stamps program. New York offers a “fair fares” MetroCard to subway riders based on household income. And transit advocates in Boston are pushing for a similar discount for low-income MBTA riders. Many seniors would qualify for means-tested discounts. Sixty-one percent of single older adults in Massachusetts have incomes that fall below a cost-of-living measure called the Elder Economic Index, calculated by the UMass Gerontology Institute. Among those who depend on senior discounts, and those who simply like to cash in, the practice has spawned a vast subculture of deal hunting and bargain chasing. Skilled practitioners brandish Golden Apple Cards to claim 10 to 15 percent off meals at Applebee’s. They flock to Dressbarn stores for 10 percent senior sales on Tuesdays and Wednesdays. And they trek to national parks from Acadia in Maine to Yellowstone in Wyoming to take advantage of their $80 lifetime passes for nature lovers 62 and over. 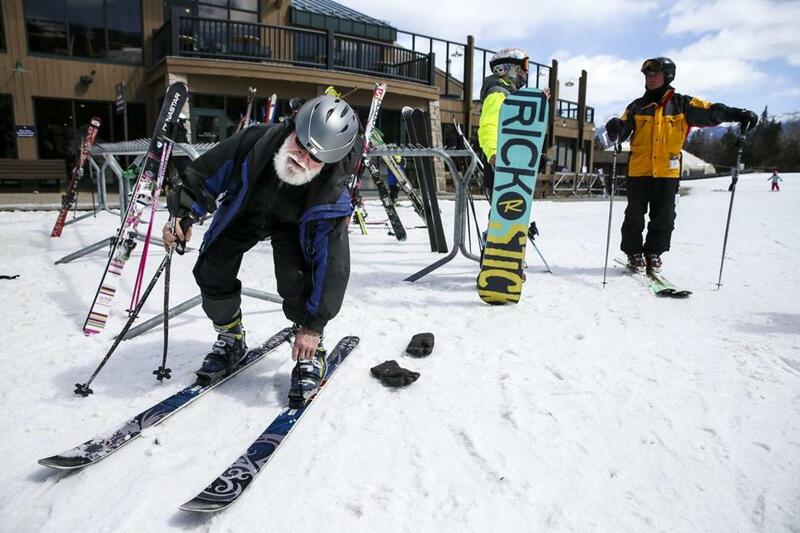 Retired entrepreneur Gareth Taube, 70, said senior discounts influence where he skis and vacations. In the winter, he frequents the Wachusett Mountain Ski Area in Princeton, to take advantage of a deal that gives him 22 percent off weekday season passes. Most of the nearly 38 million AARP members eagerly scope out dining, entertainment, and travel discounts on the group’s website, said Katherine Zorn, director of member value. For those 50-year-olds in denial about their age, the temptation to recycle their first AARP mailings is often offset by the lure of savings for members. Riding the Boston transit system may be a far cry from cruising the Nile. But Fishman, the 67-year-old Gerontology Institute director, somewhat sheepishly admits he carries a Senior Charlie Card — giving him half off on MBTA fares — though he could probably afford not to. Correction: A photo caption in an earlier version of this story misstated the age of David Karaus. He is 67.